When you can’t sell chocolate to a country full of sugar addicts, you know you have a problem. What went wrong with one of Hershey’s “innovative” chocolate treats. Americans love their chocolate, treating their sweet tooth to roughly 10-12 pounds of sweet cocoa bliss apiece each year. 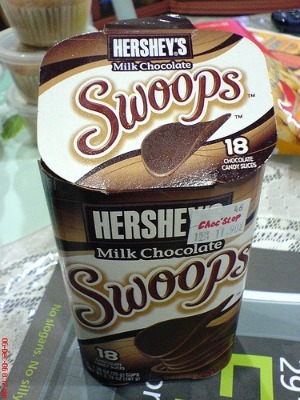 So when Hershey’s introduced Swoops in 2003, it was no surprise that everyone wanted to try a box. Swoops were slices of chocolate shaped and sized like Pringles chip and flavored like your favorite Hershey’s candy bars–Hershey’s Milk Chocolate, Reese’s, York Peppermint Pattie, Almond Joy, White Chocolate Reese’s, and toffee and almond, as well as limited edition varieties like white chocolate peppermint (available around Christmas), special dark with almonds, and strawberries & creme. Its unique curvy shape promised an “indulgent, mouth-melting experience.” But all good–or not so good–things must come to an end, and Swoops became an oops and was discontinued in August 2006. Product: Although the wave shape was interesting and definitely different for this category, it didn’t really have a purpose other than just being different. We assumed that the chocolate wrapped around a potato chip–why else would it have this distinct shape? But there was no surprise contained inside, not even a middle layer of peanut butter or peppermint to delight us. Bottom line, it was just flavored chocolate that didn’t even resemble the namesakes for which the flavors were named. Shape: Apparently Hershey’s actually felt there was a benefit to this shape. The chip conformed to the roof of the mouth for a slow, chocolate-melt experience, if you happen to like that. But the shape also implied the way we would eat Swoops–fast and furious, like the mindless munching of potato chips. With only 6 slices to each individual container, we were left unsatisfied and wanting more. Packaging: Each 3.78 oz. box of Hershey’s Swoops retailed for $1.79. The carton opened to reveal three individually sealed cups (1.26 oz. each), with each cup containing 6 slices of chocolate. That adds up to an awful lot of excess packaging for 18 slices of chocolate. Plus, if you did the calculations, you’d realize that you could buy 3 chocolate bars for about the same price, enjoy more chocolate, and throw out less packaging. Name: Naming new products is always a challenge, even when the flavor varieties are well-known chocolate icons. In this case the name didn’t help matters. Swoops was often confused with a dippable chip (Scoops), the Nike logo (Swoosh), and something to do with athletics due to the association of Sheryl Swoopes, a basketball star for the Houston Comets at the time of introduction. So what can we learn from Swoops? New & Different: High scores in the “new & different” category probably had something to do with this product getting the green light. We also believe that in-home taste tests would have been more insightful than focus group taste tests–at least when it comes to evaluating the actual eating experience and time of consumption. It’s easy to take your time to taste and experience the “slow-melt” chocolate experience when you are sitting there being paid to take your time with the product; it’s another thing to evaluate it in your daily life when you’re scarfing something down to give you some quick energy to get through your day. My guess was that more people wanted to eat it during the day rather than an indulgent “me-time” treat at night. The Health Factor: Corporations certainly spend a lot of time researching and developing new products, but sometimes you just need to step back and use some good old-fashioned common sense. Each six-Swoop cup contained 180-200 calories, 7-8 grams of saturated fat (a third of a day’s worth), and 18 grams of sugar (more than four teaspoons). Two Swoops varieties-–York Peppermint Pattie and Reese’s–had 2-3 times more saturated fat than their namesakes! Yes, most of us enjoy eating chocolate and yes, we all have to take responsibility for what we eat. But there is an obesity epidemic happening in our country. My guess is that research told them that one cup (6 slices) wasn’t enough to satisfy the majority of consumers, that it was more like 2 cups–double those calories, saturated fat, and sugar grams. As innovators, shouldn’t we tap into our moral compass and ask ourselves if we are doing the right thing? Or more importantly, why are we doing this just for the sake of a new shape without any other real value to the consumer? Again, just because we can make something doesn’t mean we should. Sustainability: The unique shape and fragile nature of the product required over-packaging to get it safely to stores and into consumers’ homes. With the world becoming more and more sensitive to sustainability, Hershey’s probably should have spent more time thinking about alternate packaging solutions. Sandstorm Inc. is an innovation firm specializing in the upfront insights and innovation process. Sandie Glass and Laura Wolfram bring a combined 34 years of experience in helping Fortune 500 companies like Procter & Gamble, Disney, Nike, American Express, GlaxoSmithKline and M&M/Mars tap into their creativity to achieve remarkable business solutions for market success. Read more of their What Were They Thinking? series on FastCompany.com.